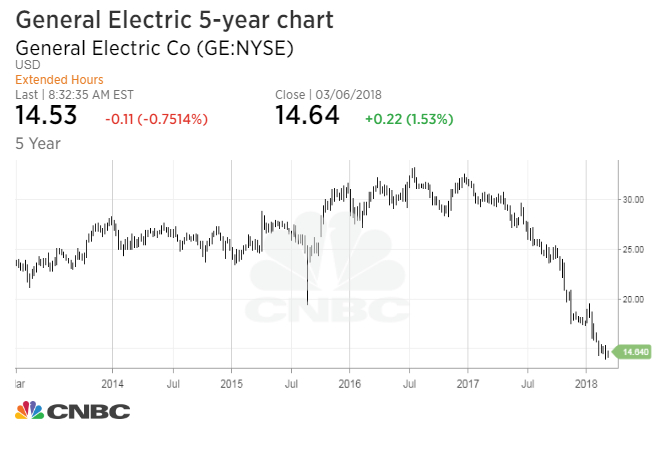 Shares of General Electric, already trading near an eight-year low, may take another hit as steel and aluminum prices rise because of President Donald Trump’s tariffs, according to Deutsche Bank. Many market analysts expect such a rise in prices after Trump announed plans on Thursday for a 25 percent tariff on steel imports and a 10 percent tariff on aluminum. The plan looks increasingly likely after the resignation of free-trade advocate Gary Cohn from the White House on Tuesday. General Electric posted a $10 billion loss in the fourth quarter and was the worst-performing stock on the Dow Jones industrial average last year. The Boston-based conglomerate recently slashed its renowned dividend and cut expectations for the coming years as CEO John Flannery attempts to turn the company around. The company has dropped 51 percent in the last 12 months and was down another 1.6 percent Wednesday after the analyst’s call. In addition to rising material costs, Inch added, the company will also likely have to compete in a souring international market as Trump’s taxes on foreign goods spark foreign frustration. Inch, who has a sell rating on General Electric, previously wrote that he expects the original Dow component to be removed from the 30-stock index.